Internet Explorer 5 was released with Windows 98 Second Edition and Windows 2000, as well as an upgrade for Windows 3.1, NT, and 95. Users of NT 3.51 must use the 16-bit version of Internet Explorer. 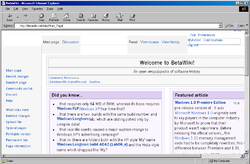 A version of IE 5 was ported to Solaris and HP-UX through through the use of MainWin's xDe environment and uses the Trident engine. IE for Mac OS uses a different engine called Tasman which is also used in Office:mac, Entourage, and MSN for Mac OS X.